Watch the roosting habits of two bluebird families with the Coveside Observation Bluebird House Package with Poles. This comprehensive kit provides all you need to mount, shelter, and monitor eastern bluebirds in your yard. The unique, Coveside Premium Two-Sided Observation Bluebird Houses are crafted specifically for eastern bluebirds, with a 1.5" diameter entrance hole and sturdy, wooden predator guard. One side of each home opens for cleaning, while the opposite side also opens, displaying a clear, Plexiglas panel underneath. 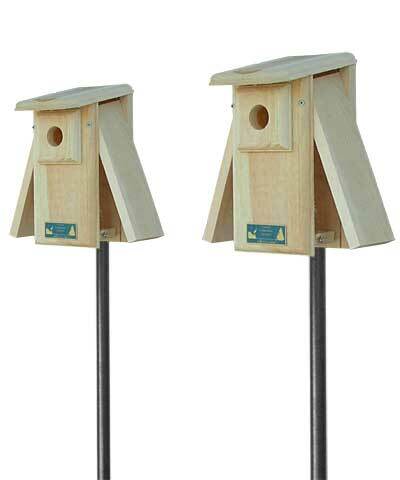 This allows you to monitor nesting activity without disturbing the roosting birds. Metal, "L" shaped hooks help these panels remain closed, and the eastern white pine body forms lasting and natural roosts. The sloped roof on each protects the nests from the elements, while ventilation gaps beneath them keep the internal temperature comfortable for nestlings. Add the included Coveside Blowfly Inhibitor Screens to the interior of the homes, helping nests stay safe from parasites. The included Erva Deluxe Birding Poles with Ground Sleeves and Mounting Adapters provide a wonderfully convenient way to display the abodes. The adapters attach to the back or base of each shelter, while the ground sleeves insert into soil for stability. The durable steel construction of these poles handily supports the houses, and their black color adds a classic look. Offer eastern bluebirds two great roosting spots with this Observation Bluebird House Package with Poles.